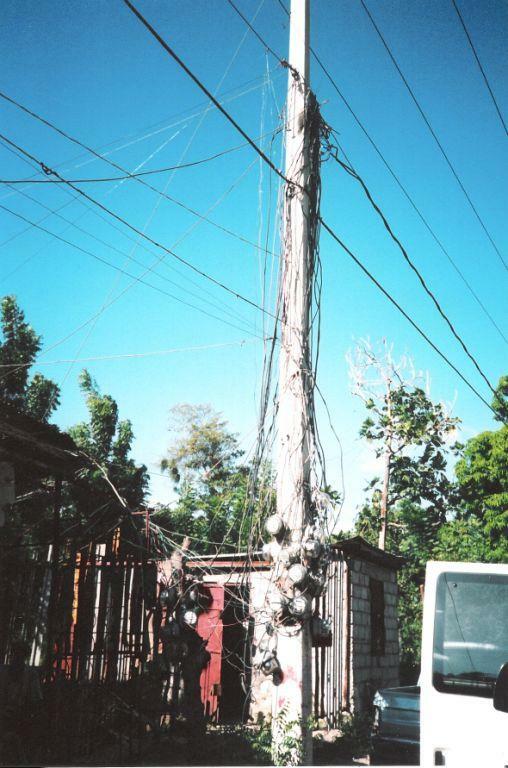 This is a Photo from a mission trip to Haiti. Seems to be common practice No electrical codes here. I wonder how the Power provider figures the meter billing here? Thankful to live in the USA with Codes to protect us from this! I wonder if those are the so-called "throw ups" that are done by local residents to steal energy from the mains. Meter readers need electrical gloves to read some of those meters and apply great care not shorting wires out, some look like that the dial is facing backwards towards the pole. Some how the POCO can't be to interested in the lost revenue here. Also no supply fuses on lampwire type cables used. Its a meter tree, they grow electric meters down there . Seriously though thats pretty scary looking.. I wonder how someone would even get up the pole to tap into things without getting "lit" or shorting anything out. I'm beginning to think the Amish just may be on to something!